Whee! What a weekend! The event happened….muhgawd, the classes were on time, which is a first, and welcome. The weather was glorious, many classes well-attended, and as always the conversations between and around were *awesome*. Thanks to everyone who attended, taught and helped! One more class on Wednesday, Lupa will be teaching Plant and Fungus totems. 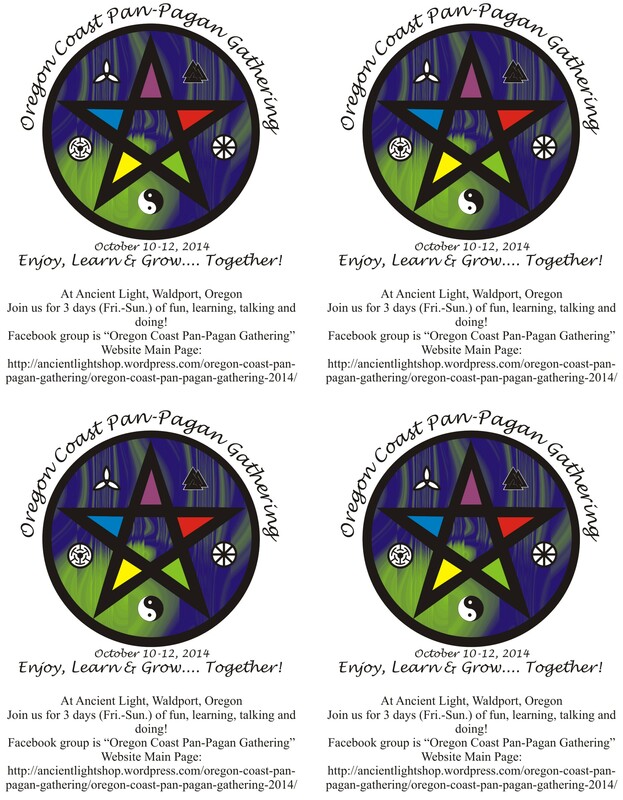 If you want to participate in discussions of activities/classes, there is a Facebook group to be found under the name of Oregon Coast Pan-Pagan Gathering . Event Post Mortem is 2pm on Sunday, November 9th. Tentative Date for 2015 is October 9-11. Please read through this page. I know that it’s a pain, but 95% of the questions that the staff has to answer will be answered right here! If you find your answer here, the staff will have more time to make the event run smoothly and maybe even some time for fun for themselves! It’s complete! If you catch any problems, let me know right away, please! We have arranged with the China Restaurant for the Friday supper again, with the special being $7.50. As usual we’ve lost some teachers and gained some right at the last minute, but we’re good to go! We still need volunteers. Please contact Anja at ancientlight@peak.org. On this blog do the “mouse hover” on the menu. There are multiple sub-pages and more will appear as time goes on! If you can’t make use of the menu bar, scroll to the bottom of the page for the links! The e-mail for the event is: ancientlight@peak.org Use this for specific questions or a printable copy of the handbook and/or other info, if you can’t access it on this blog. We will be taking cars back and forth between Ancient Light and other locations between classes. Donations for gas costs would be much appreciated. Can will be on the counter at Ancient Light. Please bring your own mug for liquids, a chair (if you have one that can be toted) and your own bedding if you’re staying over! Some classes have minimums, so sign up in person on the bulletin board starting on 10/3. It’ll be first-come, first-served. Catt’s class on Astrology requires that you contact her on the address listed. Lupa’s class is on Wednesday 10/15! The book area at Ancient Light is being reserved for informal chat by the event altar. Make use of it! There is *no* overall fee for the event! Most classes/activities have a fee or ask for a donation, so read carefully, so’s not to be embarrassed. If a class says, “donation requested” but gives no amount, put in $1 per in the teacher’s donation cans or some into the donation can for the overall event. This takes care of expenses like gas for teachers & shuttles, paper supplies for the feast and printing for classes. Some of the costs have been covered through sales of ads in this handbook. Please patronize these Advertisers! Ancient Light has a microwave and tiny fridge. The full kitchen at the community center is being reserved for classes & potluck use from 2pm Saturday on….Yes, you can heat your potluck contributions! Check with the feast organizer. Some food prep may happen at Anja’s, too, if we have an extra body to tend things. Friday night we’ve made special arrangements with the China Restaurant. Pay $7.50 per person at Ancient Light to get a ticket to have your choice of a special full meal at the group rate. If you want something more or extra, please pay the China Restaurant directly. The special pricing will be good from 6pm-10pm. …and of course we’re having a Potluck on Saturday. Please bring a dish with at least 10 servings and a donation of at least $5, if you can (this is to cover the site rental). If you’re coming from out of town, or hate to cook, bring things that don’t need refrigeration such as desserts, cheeses, breads, soda pop or even juices or salads (non-mayo) that can be kept in coolers, since we don’t have the community center kitchen until 1:30pm. 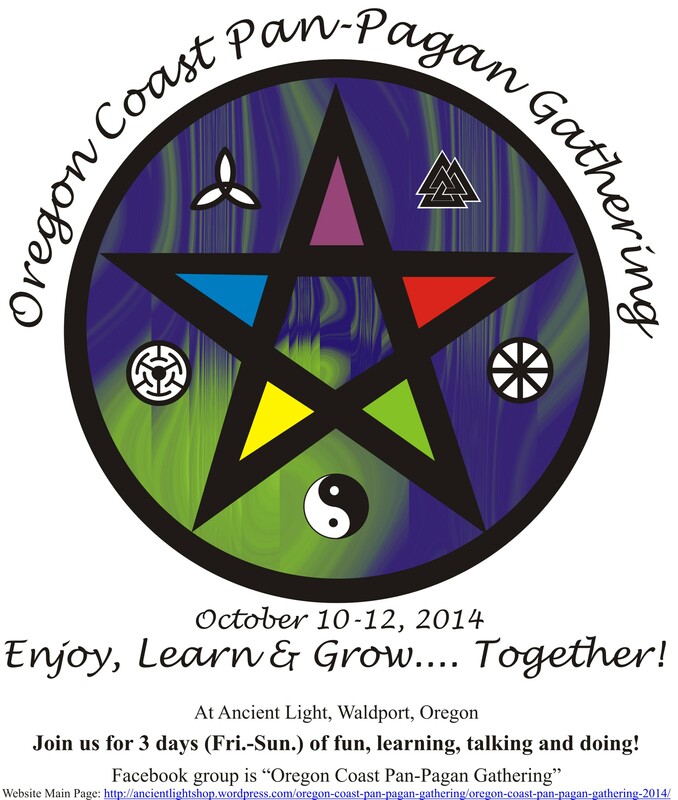 If you need suggestions on things to bring, please contact Anja at ancientlight@peak.org . Ray’s (within a mile east on 34) has hot & cold delis as well as other groceries. C&K also has a market in Yachats on Highway 101 in the middle of town. There’s a liquor store in the same building as Grand Central Pizza. Please respect the “No Pictures” buttons that you may see on some people. It’s best to ask permission, in any case. We have a *lot* of folks who cannot attend the event who would love to see some of the panels and classes, plus there are a couple of teachers who want recordings of their efforts. BTW, the easiest way to not appear in anything like this is to sit *behind* the camera! …and I’m asking those of you who bring your own cameras to respect this set of criteria. At least get permission! Anja, Tempus and Ancient Light are giving blanket permission to anyone to take pix, but watch who is in the background, please! At Ancient Light the smoking area is around the north side of the block. There is a nice awning there to ward off things from above, but be aware of the open door/windows at the Chocolate Frog and pay attention to wind direction! No smoking at Cliona’s, please. 1 – Ancient Light – Book area – This is where the event altar will be set up. Midnight Questions will be held in this area. There is a basket of tea lights on the altar. Please light a new one when the old one burns out to renew the intent. This space is to be used for informal chat for anyone/everyone. There are pillows and seats. Please make use of them! 2 – Ancient Light – Classroom – Several workshops and classes will be held here. The shop bathroom is behind this area and the shop library is here. If you pull out a book for use, please put it back. If you wish to take the book out of the building for the weekend, please sign it out on the clipboard and then sign it back in before you leave for home. Hot beverages are located in the back of the classroom. Please be aware of classes/workshops in session. 4 – Cliona’s shop is down the street. It’s the place that says, “Palmistry”. Several classes will be held here. The address is 205 Highway 101. It’s best to walk from Ancient Light, although we can run a car down for those who can’t walk two blocks. 4 – Anja & Tempus house – The kitchen and living room will be in use on Friday and Sunday, at the least. This is a pretty safe place to park and carpool from, as well. There are 5 spaces, tops, in front of Ancient Light on Friday, although on Saturday and Sunday we can spill over 5 more. There is plenty of parking in the pharmacy lot, (what used to be the grocery store parking lot) across the street, a bunch of spaces on the north of the block and around to the east side of the block, although please leave the two on closest to the Chocolate Frog open for their customers. If you’re going to be at the shop all day, please don’t leave your car in one of the close-in spaces. If you’re mobility limited, come in and let us know and we’ll shift it for you! No Parking at Cliona’s! There is only one space allotted there. Either walk or ask to have someone run you there in a vehicle if you can’t walk two blocks. Do *not* park in the lot by the laundromat/liquor store/thrift shop. They will get very upset with us. Large vehicles, like land whales (ok, they’re RV’s, but they migrate….) can park back on Starr Street. In Waldport, please do not park in front of other (open) businesses to leave your vehicles all day! They will get really mad at us. Also, please don’t leave your vehicles in the Keady Wayside, behind the Bridge Interpretive Center or the Port Docks for more than a few hours. The best places are the pharmacy lot, and along Starr Street, or the spaces around Ancient Light’s block, particularly the east side of the block (almost nothing there….) or leave the cars and carpool down from Anja’s. Posters! 3 forms: Word, PDF and JPEG…. Please, print and spread around! First is the plain poster. Next is the mini-poster size. We don’t have a lot of space during the event, but there is some (3 small tables and one chest-top that get shared..) I don’t charge for it, just ask that if you have a good time, kick me back a bit. If we end up watching your stuff (say, you want to take a class or run off to a ritual) I ask a 25% commission and that you have everything clearly marked with prices. It’s also nice if you toss something in for the raffle. Hello, I have just been added to the Elders Council and alas i will not be able to make this Sundays meeting. Just too short of notice from here in Medford. I do have some questions. I plan on attending, and am more than willing to help plan and participate. I need to know if there is camping available on site or if folks are making their own arrangements and how much it is to attend please. Thank you I look forward to hearing from you and working with you. Blessed be. Cat.. There is never a charge to come to these meetings! I’m sorry that you won’t be able to make it, but I understand that it’s a long trek. At least for the ones out here, if we have prior notice you can probably stay with someone, (either yard or house) for free. For OCPPG, again the event has no charge, although classes and workshops and activities are by donation, and all of that will be listed in the handbook. Some people end up spending as little a $10, plus the cost to get out here. Others spend $150 or so on the event, plus gas and motel, and everything in between. If you go to the OCPPG note in the menu bar, there are a bunch of things listed in the drop-downs. Read, please! and that’s where the handbook and all will show up as that all gets finished.